My cousin Carmella is amazing. When I called and told her we had decided to jump into the fire and try living in Pontelandolfo, she scurried about looking for an apartment for us. I wanted three bedrooms in the hope that I could nudge the other USA members of our extended family to hop over and visit too. That plus my two bathroom requirement made the search more of a challenge. Carmella knows everyone in Pontelandolfo and kept asking around until she discovered the gem of all gems. We are living in half of a completely updated and restored stone dwelling. Three bedrooms, three bathrooms, the formal kitchen and the working kitchen, dining room and well – just look at the pictures! We are about a 15 minute downhill walk to the Pontelandolfo piazza. Notice I said downhill walk. This is a mountain village perched high in the hills. I hate to admit it but, unless I bump into someone in the shops who would give me a lift, I usually call Jack to come and bring me back up the hill. You can see the mountains peeking out as you pull in the driveway. Yes we did rent a car – but I’ll save that story. 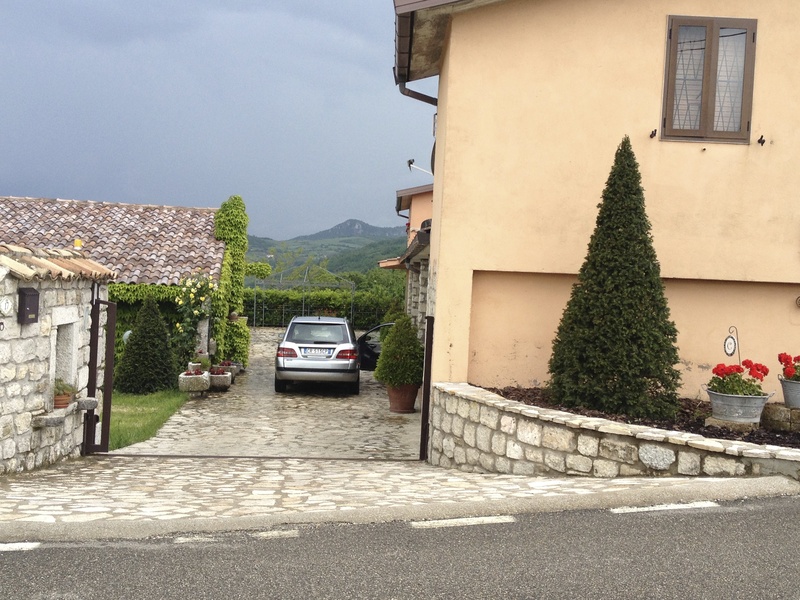 Our landlord is an incredible landscaper and the grounds include topiary trees, olive groves, oodles of vegetable gardens, fruit trees and – well you get the picture. Most homes don’t have the kind of landscaping that Nicola has done. There will be pots of flowers but we seldom see lawns and shrubs. Everyone has a subsistance garden, fruit trees and olive trees. Food comes first! We are lucky to be renting from a true artist. The small building on the left has a wood burning oven. It is where they smoke meats, sausages, bake bread and put up food for the winter. Don’t let the beauty fool you. This is a working farm complete with chickens . 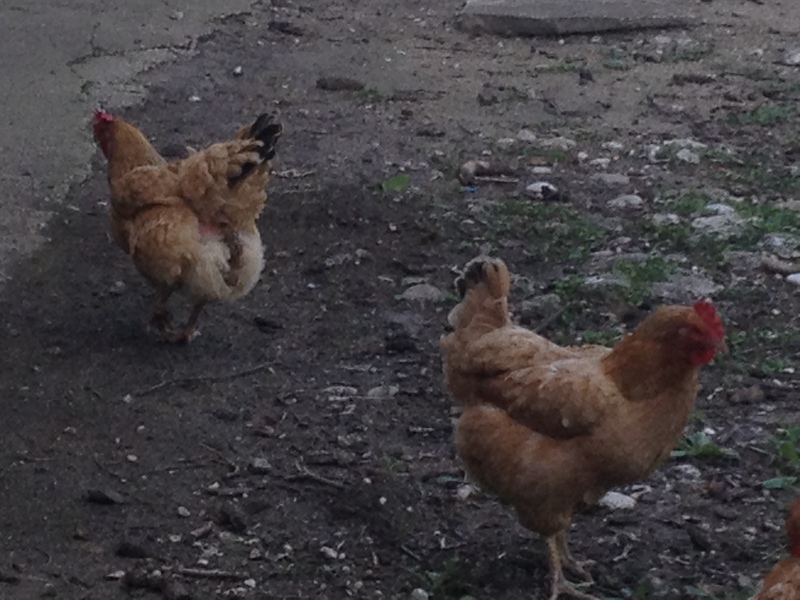 At the end of every meal we go out our back door and pitch the left overs to the chickens. They love fresh fruit and vegetables too! Curious about inside the house? Or what a great place like this costs? Well, all I’ll share is that the rent for this heavenly spot is less than you can get a studio apartment for in Hillsborough, New Jersey. Let’s take a look inside. Walk up to our front door – oops beware the cat may be sleeping on the chair or Zia Vittoria may have left us some fresh eggs. The front terrace is a great place to stare at the mountains, read a book or just – well – do nothing. 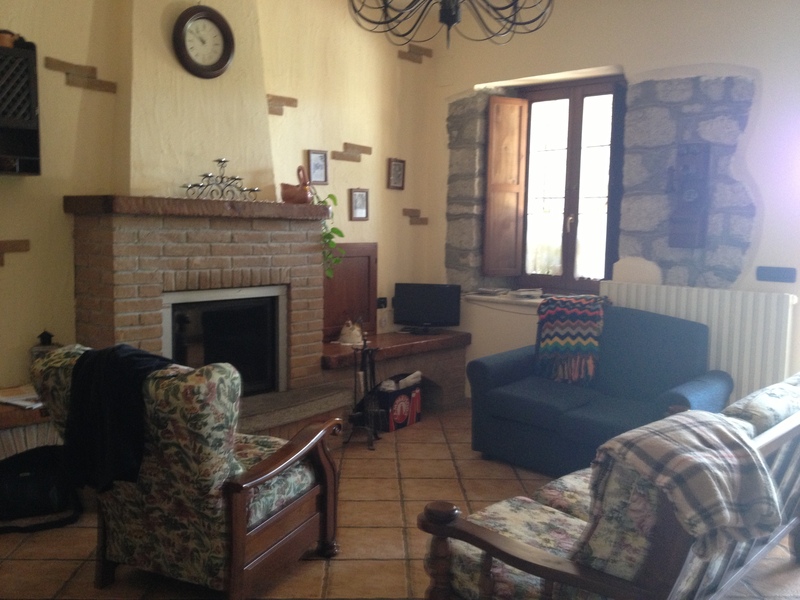 As you walk inside you are in the sitting room – note the fireplace. That not only provides ambiance but is also the source for the heat in the whole house. Many folks here have heating systems that are based on hot water being heated by the wood burning fire place or pellet stove. You have to make sure that you have a fire going if you want to take the chill off the house. I spent the first night here whining about how cold I was – all those summer clothes I packed don’t keep me warm in the mountain. All the floors are terracotta that sends the cold right up my legs. Nicola explained the heating system the next day. Then I stared at Jack, moaned and really whined until he made a fire and kept it going. Yeah, yeah, I know I should have shut up and schlepped the wood in. Pffff – sometimes a division of labor is a wonderful thing. These wood burning systems absolutely work. We also have a gas fired on demand hot water system that we turn on just to take showers or wash dishes. Everyone says that electricity and natural gas are expensive so we honor that. I will find out just how those prices compare to what we pay in New Jersey. We don’t have to worry about running out of wood. 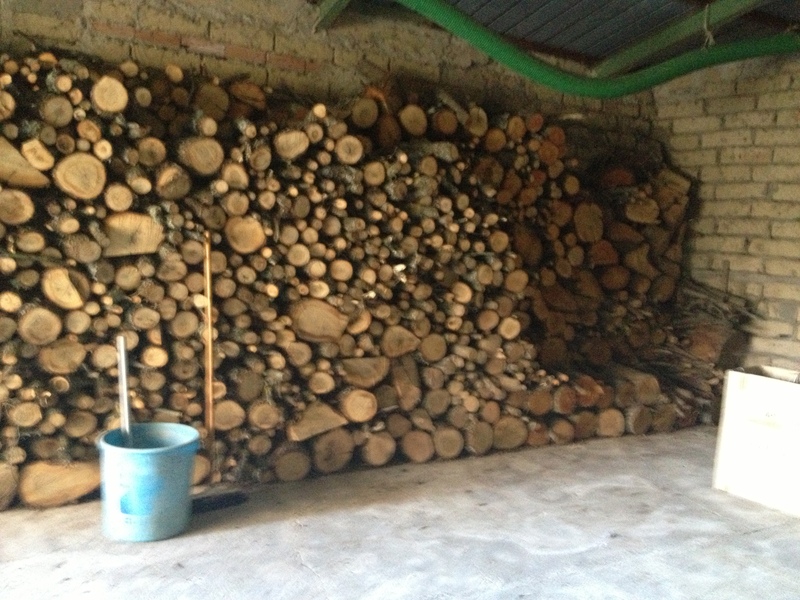 The back of the house has a storage area that is chock full of wood. Much of it is harvested in the forest. Everyone here really works hard and saves money by living off the land. Look there is Jack reading his iPad in the dining room! Note the interior archway. The entire house is made of stone with colored cement overlaid. It will keep us incredibly cool in July but today, I am still feeling the chill. Enough chatter. A picture is worth a thousand words. I’ll let them tell the rest of the story. Previous postOn the Road to Pontelandolfo! Next postBuon Compleanno a Me! OMG! Midge! This looks amazing! These pictures make me want to hop on a plane to Italy and forget about life in the states. How’s the weather in the winter? Or do you need a second geo blog. Hmmm, weather? Whether or not snow is something I really would miss – that is the question. The weather is similar to New Jersey and the stone houses are cold. I really need to think about this myself. We have been here in January and the snow in the mountains is fabulous to look at. The wine is still amazing and the people are just fabulous. But, the secret of those little Italian ladies living so long in those hilly villages is precisely because they walk up and down all the time. You are so right Larry! I may have to do it in stages until my legs get used to it. It’s a goal! How thrilling. I was married in Bagnoli, NATO base. Lived outside of Naples in Pozzuolli for 2 years. Enjoy every minute. Arrivadella. How exciting that must have been. Thanks for following the blog. I bet you’ll be able to add a lot to the dialogue. Did you subscribe? Fabulous! Enjoy! It’s been fun reading your blog, Midge. Living the dream. What a wonderful place. Great blog, Midge. Thanks for letting us live vicariously through you! Wow! Yes, walking up and down hills is good. Maybe I’ll get the courage to visit the villages in the hills around Naples and find the remnants of my mother’s family. It was a delicious journey tracking down my father’s family. I found his cousins about 15 years ago. The tragedy is that the first time my dad came to Pontelandolfo in the early 1960’s his aunts and uncles were still alive but he never found them. Then a pazillion years later his tenacious daughter bangs on doors and unearths his cousins. Luckily, we made sure he got back here to meet them.